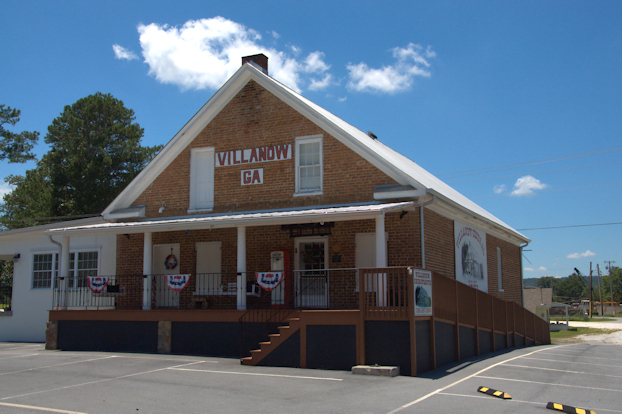 Most often referred to today as the Villanow General Store, this structure of handmade brick sourced at the site began operations around 1840 and has had numerous owners over years. It’s among the oldest extant stores in Georgia. The only one I know of that’s older, in fact, is the Brick Store in Newton County. It also housed the Villanow post office for many years, the Odd Fellows lodge, and even the Justice of the Peace. The community was known as Sunset at the time it was constructed. Roland Kinsey and William D. Underwood were two of the first owners of the store, though it has historically been associated with Joseph Warren Cavender (1845-1919). Cavender, who had served as postmaster and mayor of Villanow in the 1870s and 1890s, owned the store until his death, but had at least one partner in the business, James Harvey Shahan (1868-1949). Owners who followed over the years include Claude Clements, Dr. J. A. Shields, M. Gordon Keown, J. C. Phillips, Otto Morgan, Roy Morgan, Ottis Poarch, O. H. “Doc” Penland, and Rodney Edwards. Mr. Edwards was instrumental in helping save the store when a four-lane highway was proposed through the community. I had a nice visit with Dr. Michael Kisner who moved his chiropractic office into the store in 2015. His wife Deborah has roots in the area and the couple are happy to have been able to save such a landmark. They’ve done extensive work on the structure, retaining as many of its original features as possible.